Since we’ve moved to an alpine village in the Tarentaise Valley we have not yet taken the time to explore the resort of La Plagne. Last week, we finally did it! 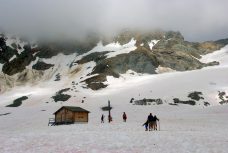 We waited for the snow to melt and for Summer to return to cross the great domain using the ski lifts and free shuttle buses. Here is a little account of our excursion… which will allow you to get an idea of the splendid vistas that await you! When I say ‘day out‘ please don’t think this was a day of long and tiring hikes. As this was our first visit to La Plagne, I brought my 5 year-old girl Aimée with me along an itinerary with numerous ski-lifts and free shuttles. 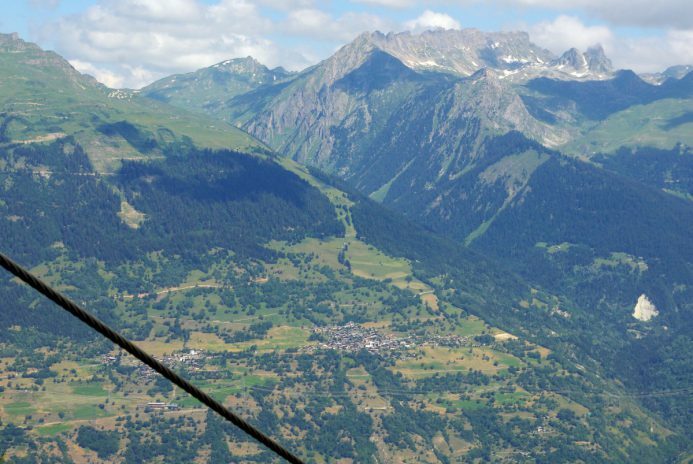 The goal was to explore the land that we can see from our village, Granier, on the other side of the valley! This excursion took us 5 hours… but of course we stopped off a number of times to admire the views and take photos! The highlight of the visit was the view from the Roche de Mio at 2,730m high. A magnificent view over the Tarentaise Valley, the Beaufortain, the Mont Blanc on one side. And on the other, the snow-capped peaks of the Vanoise massif (Grande-Casse, Grand-Bec, Péclet-Polset) and in the distance, the Meije and the Grandes Rousses. Here is the itinerary that we used. You can follow it too and discover the vastness of the domain of La Plagne. 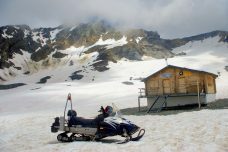 And if weather permits, you’ll be able to reach the Chiaupe glacier, very close to the Bellecôte summit at 3,000m high! We left our village Granier in the middle of the morning and after a stop at the Tourist Office of Aime-la-Plagne to get our ski-lifts passes, we started the drive up via the famous hairpins of La Plagne. We stopped at the hamlet of La Roche. I parked the car around 11am at the huge carpark in the hamlet of La Roche. This is the site of a famous bobsleigh circuit built and used for the Winter Olympic Games of Albertville in 1992. The bottom station of the chairlift is reached by crossing a little footbridge spanning the Arc stream. The chairlift is very practical as it makes it possible to avoid driving up to the centre of the station. It starts at 1,523m high and reaches Plagne Aime 2000 à 2,120m. A nice drop of approximately 600m! Aimée really loved this type of ski-lift. The climb is smooth and peaceful. You can hear the sweet twittering of the birds, the water below, cowbells ringing in the distance. And a nice pine scent that refreshes the senses! It offers magnificent views over the valley and the town of Aime. The chairlift takes 6 minutes to reach the station of Plagne Aime 2000. A futuristic vision… or a visual nightmare for some! The modern station of Plagne Aime 2000 (formerly Aime-la-Plagne) is puzzling to say the least. Here the hand of man designed a property development at a high altitude (approximately 2,000m) on mountain pastures. 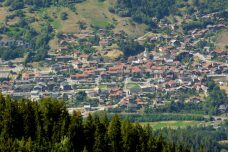 Yet, I still have to pinch myself that the hamlet is situated on the same commune as my village (which is visible on the other side of the valley, 800 m below). It’s like being in a completely different world! At the foot of the gigantic modern chalets (nicknamed Paquebot des neiges) is the bus station from where we took the free shuttle. The bus offers a regular service (every 30 minutes) in the direction of Plagne Centre. 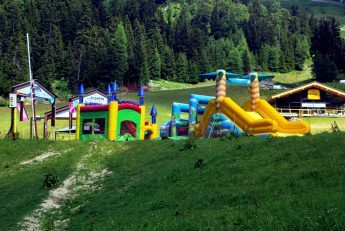 If you have plenty of time (and you’ve just missed the shuttle) you can walk down to Plagne Centre by the mountain pastures. It isn’t far at all and you’ll enjoy beautiful views. Here we are at the heart of the station. The connection with the Plagne Bellecôte shuttle was about to leave. We didn’t have time to explore Plagne Centre. Anyway the station’s centre was under work. The shuttle to Plagne Bellecôte calls at several stops in Plagne 1800, a hamlet situated downhill. Then it goes up to Plagne Bellecôte, the terminus. So, since Plagne Aime 2000, Aimée and I had been on two buses to get here. We were curious to discover this hamlet. Here as well, the change of scenery is guaranteed. An audacious contemporary architecture. The station can look a bit displaced in Summer. You have to imagine it in Winter when it fits much better to a natural environment covered by snow. The ski runs stretch down to the foot of the buildings where ski lifts run uphill again. This must be really cool in winter. This is the concept known as “ski-in, ski-out resorts“. But as we are still at the beginning of the Summer season the station is not in full swing. 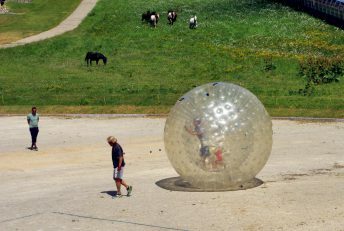 For kids, many activities are available: bouncy castles, pony treks, and something that made a great impression on Aimée: walking inside giant bubbles ! Anyway we didn’t have much time to get distracted. The next step of our excursion was to ride the Roche de Mio télécabine. Its bottom station is located next to an information desk of the Tourist Office of La Grande Plagne. 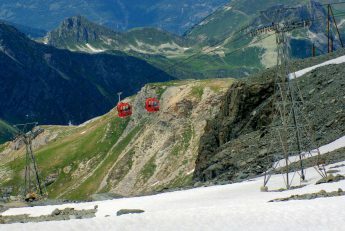 The bottom station of the télécabine is located at 1,940m in the centre of Plagne Bellecôte. 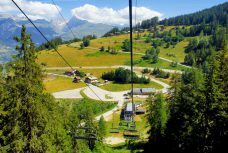 The ride is in fact made up of two sections linked by an intermediate station at Belle Plagne. 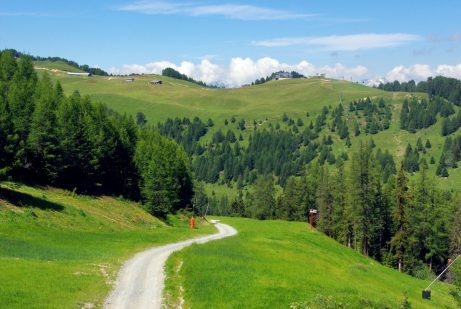 The first ascent flies over the mountain pastures between Plagne Bellecôte and Belle Plagne. The intermediate station at Belle Plagne (2,086m) is recognisable by its little belfry that gives it a picturesque air. We could have stopped there to discover Belle Plagne (the télécabine doors open to allow us to get out in case). The télécabine goes under the inside of the station very slowly along the embarkation/disembarkation tracks. And suddenly, the launcher strongly releases our cabin. The ascent to the Roche de Mio truly begins now! Belle Plagne was built at the beginning of the 1980s. By observing it from the télécabine it makes sense that it doesn’t look like the other hamlets of the station (Plagne Aime 2000, Plagne Bellecôte, Plagne Centre). Look how pretty this station is (hence its name of “Belle Plagne“!) 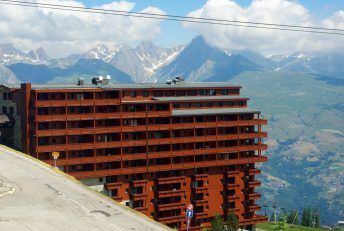 The use of traditional materials from the Tarentaise Valley (stone, wood and lauze) was intended for a better fit and to blend with the surrounding area. The intermediate station was opened in 1982 in the centre of the property development. 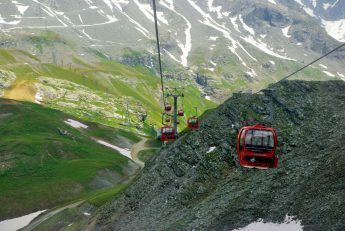 I’ve seen photos taken from the télécabine in Winter and I have to say that the ride in Summer is much more impressive! Five year-old Aimée showed no fear of heights. As for me it went much better than anticipated. Who knows, our eyes are maybe used to mountain landscapes now? Then after crossing a rocky ridge (crête des Bourtes) we come down in a plateau before ascending again until the Roche de Mio. This is where we see a marmot (for the first time this year!) that stares at us lazily. For sure they must be used to this mechanical gondola going back-and-forth! 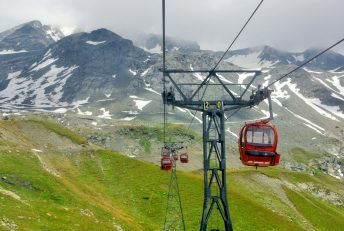 The télécabine takes 15 min and 40 secondes to cover 3,700m in a drop of 791m until the top station. This is enough time to enjoy the landscape, observe the marmots… and even get a few scares! The arrival at the Roche de Mio is not very glamorous. Don’t expect to find a picturesque station. The light grey corrugated-iron structure with vertical brown stripes looks more like some sort of a shed. Don’t take much notice of it and focus on the views! As it name indicates, the télécabine of the Roche de Mio gives access to the eponymous summit. But just before reaching it, make you way towards the side looking over the Tarentaise Valley / Mont Blanc. You’ll find a mountain restaurant and a few picnic tables. Then go round the station to the right. A complete change of scenery. In front of you rises the snow-capped peaks of the Vanoise. To the left, a rather steep track (length of 170m) climbs to the summit at 2,729m high. At the summit an orientation table tells you all you need to know about the peaks and mountains that are visible. The panoramic view is the most dramatic of all the views we’ve been enjoyed during the excursion. the northern and bleak side of the Grande Casse (3,855 m), Savoie’s highest peak. I was used to seeing the mountain from another angle on my walks in the valley of Pralognan-la-Vanoise. 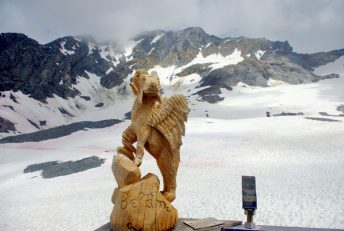 the Saulire of the Courchevel domain (2,738 m), also accessible by ski-lifts in Summer. The peak is more or less at the same height as us! Of course, all of this didn’t make much sense to Aimée. And I didn’t want to impose a geographic lecture on her. At least she can recognise Mont Blanc and I’m happy with that! It’s only when we came back home that I studied my photos to find the names of the mountains. In fact, the télécabine of Bellecôte serves as an extension to the Roche de Mio télécabine. In Summer, it allows you to reach the glacier within 12 minutes and 11 seconds. This is the highest point of the domain of La Plagne that us, tourists, can access without effort. The ride starts with a dizzying descent towards the intermediate station of the Chiaupe Pass (col de la Chiaupe, 2529m). Then the climb becomes much more steeper and longer. The télécabine crosses a sharp rocky ridge. 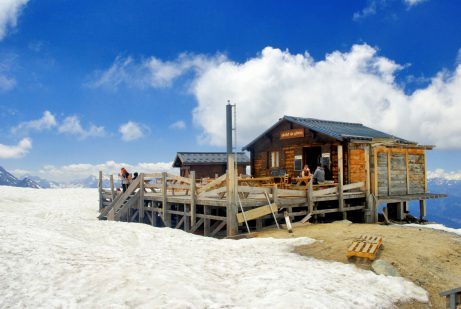 The arrival station is located at 3.030m high, which is 400m below the summit of Bellecôte. Exiting the station it’s not hard to consider how long and tough our last Winter was. For Aimée and me, it is like going back to Winter. Fortunately we had put on our walking shoes. We walk a few metres on the snow towards a rocky spur. The view is amazing but thick clouds already cover parts of the neighbouring peaks. I’ll wait for August to come back to the glacier. Apparently there is an ice-cave to visit and a track climbs one hundred metres to an orientation table. As for now, we won’t delay on the site. Despite our jumpers (the wind is cold) and the mysterious dramatic landscape, we choose to walk back to the télécabine station. And to end our adventure in La Plagne, we follow exactly the same itinerary back to the car park in La Roche. One would think that, having not walked much, we were in good condition at the end of the day. Yet we were tired. One is not always aware of how tiring the ski-lifts, the shuttle rides and the many small walks from one point to the other can be and our legs were weighing us down towards the end of the day. Without mentioning the invigorating mountain air. But once in the car, one drives down from La Plagne with stars in their eyes. Memories of breathtaking vistas. The glorious summit of Mont Blanc overlooking the Alps. The fantastic opportunity to have been onto a glacier at more than 3,000 metre high. Seeing the the snow-capped peaks of the Vanoise. As for Aimée, she will remember the ski-lifts that she is thrilled with and beats an amusement park! With English as her mother-tongue, she now knows all the French terms to identify them: un télésiège (a chairlift), une télécabine (a gondola)… I only have to bring her to un téléphérique (a cable-car) and un funiculaire (a funicular) to complete her vocabulary ! Find out more about the free inter-station shuttle buses we took in La Plagne (see the dates and times here). The frequency of the buses are often of 30 minutes. Having said this, if you’ve just missed it, take the opportunity to explore the hamlet, have a drink on a terrace or get an ice-cream! My advice before getting to the domain is to check the weather Live with these webcams. 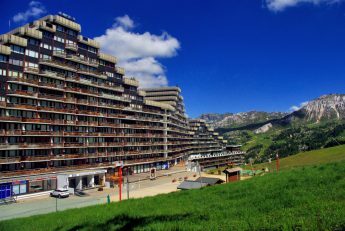 If you have any questions about staying in La Plagne, visit the website of the Tourist Office of La Grande Plagne dedicated to the Summer season. Did you like what you read about La Plagne too? If so, share it on Facebook or Twitter! Wow ! Still so much of France to explore. Great photography, as usual, Pierre. WOWOWOW what a beautiful place! Thank you for sharing – definitely adding to the next trip list!